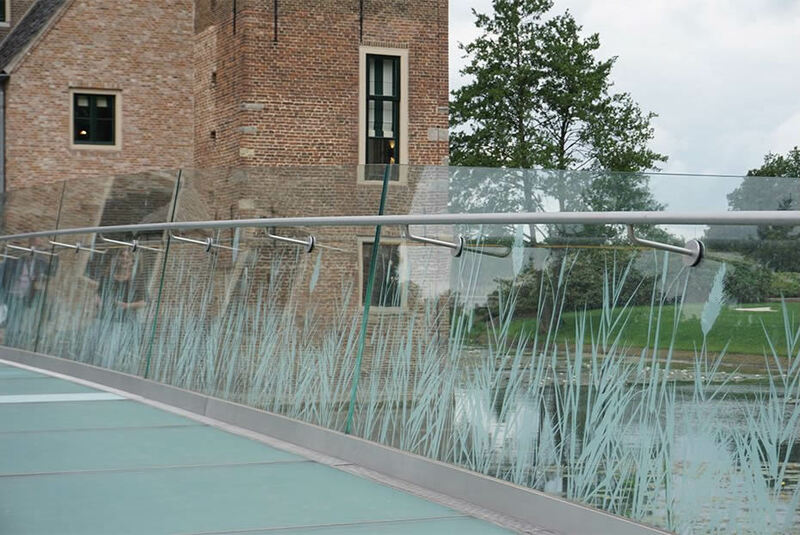 A new high-quality and slim detailed access bridge was designed entirely in glass and bead blasted stainless steel. Ruurlo Castle was chosen to be the second location of Museum MORE. Therefore the old wooden access bridge needed replacing. 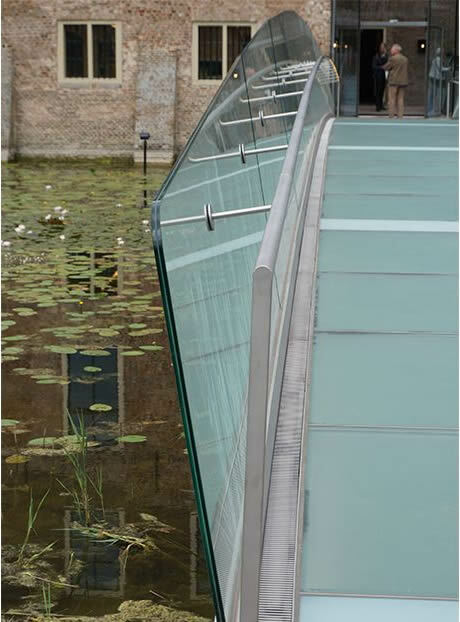 A new high-quality and slim detailed access bridge was designed entirely in glass and bead blasted stainless steel. The contemporary bridge contrasts with the 14th century castle and surrounding park. The bridge has a span of 32 meters and is 2.7 meters wide. The weight is largely carried by four concrete foundation piles underwater. These poles have been especially chosen to prevent vibration as much as possible. The piles are centered under the bridge in a way that the bridge appears to float above the water. 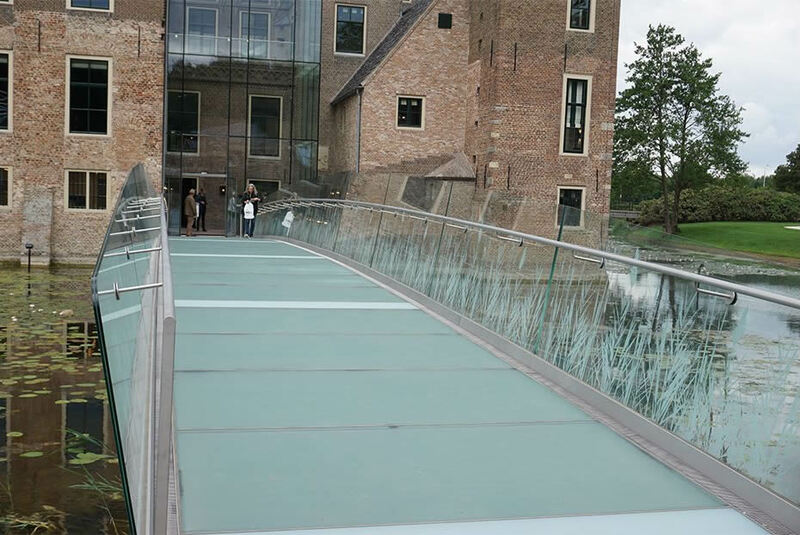 The bridge deck is made of profiled frosted glass and it has an anti-slip layer. The railings and the underside of the bridge deck are kitted up with a LED line that gives the bridge a magical look. Due to the combined steel and glass construction, the bridge has a slim frame and the appearance is elegant. The carriers in the longitudinal direction of the bridge act as a mounting profile for the glass balustrade and the walkable floor. In addition, this longitudinal tiebeam has a complex geometry because the stainless steel structure of the bridge is lightly illuminated and consequently it gradually becomes wider towards the center. With the thatch motif in the balustrades, the bridge blends well with the surroundings, whilst the glass also fits in with the museum’s glass entrance hall. In case of an emergency the bridge is actually strong enough to carry the weight of a service vehicle.